Today's blog post and giveaway is brought to you by Motor Oil Matters, or MOM, a new consumer education and industry watchdog program by the American Petroleum Institute. They believe in using quality, licensed motor oils and want to avoid using those who engage in using deceptive practices. 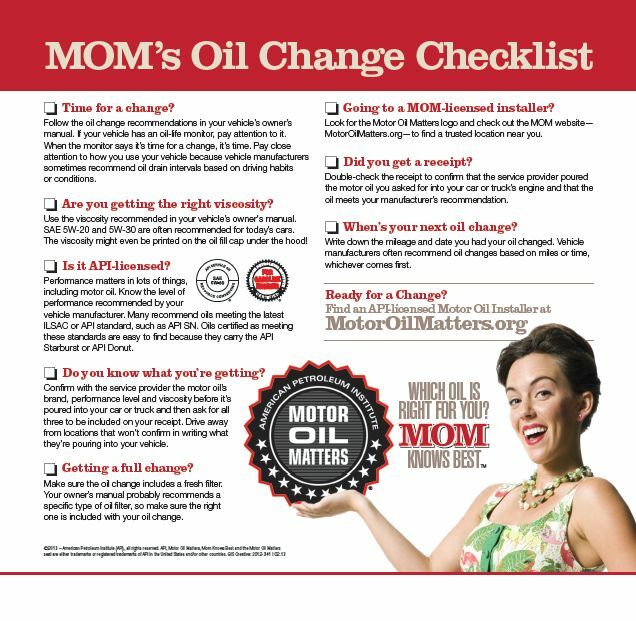 Motor Oil Matters has this great checklist to bring with you next time you get your oil changed.Download your copy here. Motor Oil Matters is giving away $50 towards one lucky winner's next oil change! Disclosure:gift cards and information has been provided by Motor Oil Matters.